Operation Burnt Frost was the code name given to the military operation to intercept and destroy a non-functioning U.S. National Reconnaissance Office (NRO) satellite named USA-193. The launch occurred on 20 February 2008 at approximately 10:26 p.m. EST from the USS Lake Erie, which used a Standard Missile-3 (SM-3) to shoot down the satellite. Only a few minutes after launch, the SM-3 intercepted its target and successfully completed its mission, by neutralizing the potential dangers the errant satellite originally imposed. While the threat was mitigated, Operation Burnt Frost has received much scrutiny from other countries, mainly China and Russia. USA 193, also known as NRO launch 21 (NROL-21 or simply L-21), was an American military reconnaissance satellite launched on December 14, 2006. The USA-193 was owned by the NRO and its precise function and purpose are classified. However, several websites speculate that the satellite was probably a high resolution radar satellite intended to produce images for the NRO. This argument is additionally supported by the fact that the satellite used a similar inclination to that of a Lacrosse Radar Satellite. Lacrosse is a terrestrial radar imaging reconnaissance satellite operated by the NRO. It utilizes a synthetic aperture radar (SAR) to acquire high resolution images regardless of cloud cover. The satellite was launched from Vandenberg Air Force Base at 1 p.m. PST aboard the Delta II space launch system. This marked the first launch conducted by the United Launch Alliance since it took over the program from Boeing Integrated Defense Systems on December 1, 2006. The successful launch represented a record 49 successful consecutive operational launches for the Defense Department. While the launch was successful, ground controllers lost control over the USA-193 satellite shortly after it was established on its orbit, and were unable to regain control. The satellite itself posed minimal risk of falling and causing damage. However, the satellite carried hydrazine fuel which is very toxic. In 2008, President George W. Bush decided this risk would be too great and tasked United States Strategic Command to destroy the satellite to preserve human life. While there was most likely early speculation about the USA-193's degrading orbit and the risks it might cause, established talks with military involvement began as early as December 2007. However the birth of Operation Burnt Frost occurred on 4 January 2008, when President Bush ordered that the threat of USA-193 be mitigated. On 27 January 2008 information about the orbital decay of USA-193 was given to the media. Several of the initial reports projected that the satellite would return to earth sometime in late February, early March. Additionally, these reports suggested that likely no action would need to be taken as the satellite or any debris would have a small chance of hitting any inhabited area. However, White House National Security Council spokesmen Gordon Johndroe, did mention that the U.S. government was monitoring the satellite's decay and that it was examining different options to “mitigate any damage”. Also, four anonymous U.S. Officials did report that the satellite, which never became operational, would have toxic rocket fuel (hydrazine fuel) that could pose a danger if the tank did not explode on re-entry. On 14 February 2008 General James Cartwright, the Vice Chairman of the Joint Chiefs of Staff, made a public announcement that the U.S. intended to shoot down USA-193. In this announcement he laid out several criteria into when, how and why the satellite would be shot down. The major objective was to reduce the risk to space, air and terrestrial platforms. He explained that they would wait for the shuttle to land, so the potential harm to the shuttle would not be a factor. Next they wanted to wait until the satellite was close to re-entry, this would limit the amount of space debris created. Finally, they did not want to let the satellite enter the earth's atmosphere because of its non-aerodynamic characteristics, which would make it extremely hard to intercept. He suggested that these criteria gave them an eight-day window. To meet the flexibility of this operation the government established that the U.S. Navy and the Aegis Ballistic Missile Defense (BMD) would be the best option. It had the ability to be a mobile asset and by utilizing the SM-3 (Standard Missile 3) it would have the ability to reach the necessary altitude. In addition the choice to use Aegis BMD was in large part due to its successful track record in which it has successfully shot down 13 of 15 attempts at ballistic missiles. General Cartwright stated that if the satellite came down in one piece that nearly one half of the spacecraft would survive re-entry, which would spread the toxic cloud of hydrazine gas roughly over the size of two football fields. This potential risk seemed high enough to prompt the government and military to act as he stated “the regret factor of acting clearly outweighed the regret factor of not acting". Days prior to the launch the USS Lake Erie (primary) and USS Decatur (backup) sailed several hundred miles northwest of Hawaii to her rendezvous point. The USS Lake Erie was chosen because she was the U.S. Navy's most experienced ballistic missile killer. The USS Russell was also a backup but remained in port at Pearl Harbor. On 20 February 2008, at 1:00 p.m. EST Secretary of Defense Gates, with consultation of the White House, approved the mission. The launch happened at 10:26 p.m. EST and the collision with the satellite happened a few minutes later. On 25 February 2008, the Department of Defense announced that based on debris analysis, that the objective of destroying the hydrazine tank and reduction, if not elimination, of the risk to people on Earth was achieved. Following the operation, China and Russia criticized the U.S. operation. The destruction of USA-193 came just weeks after Russia had drafted a new treaty to ban space weapons which was backed by China at a UN-sponsored forum. This treaty would ban the use of weapons against satellites or other spacecraft. This prompted the Russians to accuse the United States of using the hydrazine gas as a cover-up to test an anti-satellite (ASAT) weapon. They claimed that several countries’ satellites which used toxic fuel have crashed into the Earth in the past but never warranted such “extraordinary measures”. Furthering this notion, others have speculated that the toxic gas would have likely not survived re-entry regardless, and even if it had that the risk would be extremely small. These speculations have led many to believe that Operation Burnt Frost was in response to China's ASAT test on 11 January 2007 and to fear this would begin another “space race”. However, unnamed U.S. officials continued to deny that the shooting down of the satellite was in response to China's ASAT test one year prior, or that they were trying to protect classified satellite technology. 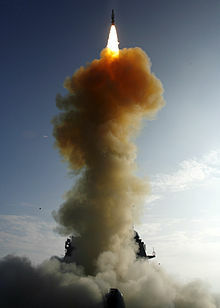 To promote transparency, the U.S. delegation to the Committee on the Peaceful Uses of Outer Space stated that after the operation concluded, the special modifications made to the two remaining technical missiles and three naval vessels were removed and that the United States "has no plans to adapt any technology from this extraordinary effort for use on any current or planned weapon system." U.S. Officials pointed out that the U.S. had no reason to prove that it could shoot down a satellite, as the U.S. had already publicly done so in the 1980s. Another key difference pointed out by General Cartwright was that this intercept happened at a much lower altitude, whereas China's ASAT weapon destroyed a target at a much higher altitude, which resulted in the creation of debris which continues to pose a potential hazard to other spacecraft. Finally, U.S. officials again affirmed that the mission's intent was to preserve human life. Wikimedia Commons has media related to NROL-21. ^ Webb, Angela (February 26, 2008). "Joint effort made satellite success possible". US Air Force. Archived from the original on July 16, 2012. ^ a b c d e "Aegis One Time Mission". Missile Defense Agency. ^ a b Beljac, Marko (March 31, 2008). "Arms Race in Space". Washington, DC: Foreign Policy In Focus. ^ a b "Decaying spy satellite". Heavens Above. ^ Shalal-Esa, Andrea (March 7, 2007). "U.S. NRO spy satellite may be total loss". Reuters. ^ a b c Krebs, Gunter. "NROL-21". Gunter's Space Page. ^ a b "Delta II Carries NRO Payload Into Space" (Press release). The Aerospace Corporation. December 14, 2006. ^ a b c d PJ Blount, ed. (2009). "USA-193: Selected Documents" (PDF). Special Topics in Aerospace Law Series. The National Center for Remote Sensing, Air, and Space Law (1). ^ a b Steinhauser, Lucas; Thon, Scott (Summer 2008). "The Power of Social Networks". Ask Magazine. No. 31. NASA. pp. 17–19. ^ a b "U.S. downplays threat from falling satellite". MSNBC. January 28, 2008. ^ "U.S. Spy Satellite, Power Gone, May Hit Earth". The New York Times. January 27, 2008. ^ a b c "Operation Burnt Frost Videos". How Stuff Works. ^ Satellite Shootdown Extras: General Cartwright Part 2. The Military Channel. February 14, 2008. ^ Mount, Mike (February 14, 2008). "Officials: U.S. to try to shoot down errant satellite". CNN. ^ "Satellite Debris Analysis Indicates Hydrazine Tank Hit" (Press release). US Department of Defense. February 25, 2008. ^ "Russia proposes treaty to ban space weapons". New Scientist. February 12, 2008. ^ a b "US spy satellite plan 'a cover'". BBC. February 17, 2008. ^ Shachtman, Noah (February 15, 2008). "Experts Scoff at Sat Shoot-Down Rationale". Wired. ^ Kelso, TS. "Chinese ASAT Test". Celestrak. ^ a b Roberts, Kristin (February 14, 2008). "Pentagon plans to shoot down disabled satellite". Reuters. ^ "COPUOS 767th Meeting: Unedited Transcript" (PDF). April 1, 2008. Retrieved January 4, 2019.